While today marks the official "holiday" celebrating everyone's favorite crustacean, we think every summer day should be National Lobster Day. This is superdecadent brunch food. To save time, you can use pre-cooked lobster meat. In Maine you're likely to find lobster rolls served two ways. Innovators prefer a crunchy, tangy and slightly spicy version of the lobster salad that includes celery, lettuce, lemon juice and a pinch of cayenne. Purists leave out those ingredients because they believe nothing should interfere with the mix of sweet tender summer lobster and mayonnaise. This elegant dish pairs sweet lobster with garlicky mushrooms. 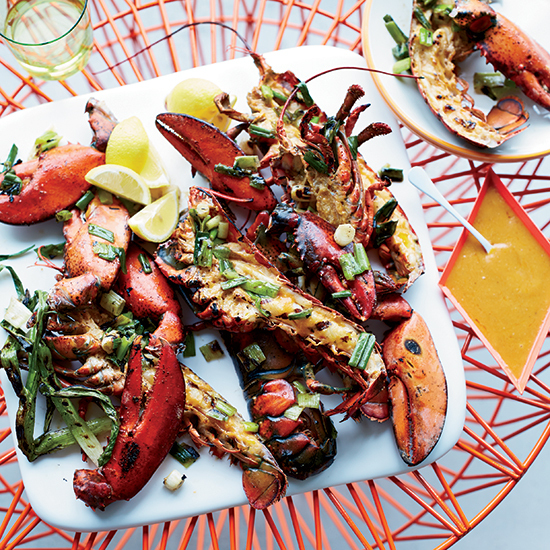 Grilling lobsters at home, like F&W’s Gail Simmons does, is supereasy. This fun recipe from Andrew Zimmern engages all of the senses, takes advantage of the boiled lobster boredom and is simply delicious any time of year. When Chris Yeo was growing up in Singapore, he went to restaurants to eat chili crab, the classic Singaporean dish of whole crabs in a potent red chili–garlic sauce. "Nobody made chili crab at home—it was so much work to prepare," he says. Here, he's modified the traditional recipe by adding a little ketchup to the sauce (a not-uncommon ingredient in southeast Asian cooking) and substituting lobster for the crab.